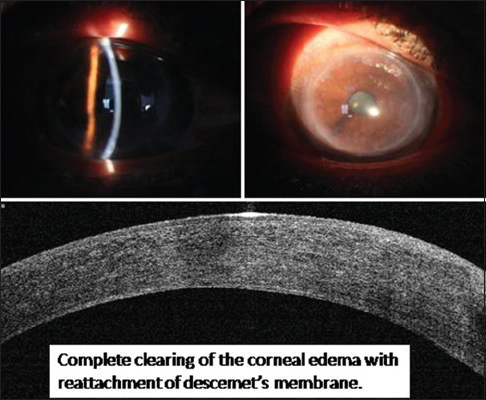 This paper reports a case of spontaneous Descemet's Membrane (DM ) detachment 20-years after penetrating keratoplasty (PK). The patient presented with acute onset blurred vision in the right eye associated with mild ocular discomfort. There was no prior history of trauma. The patient had undergone PK in the right eye 20 years back. Detailed ophthalmic examination showed best corrected visual acuity of hand movements close to face in the right eye and 20/80 in the left eye. The right eye showed diffuse graft edema but no congestion, epithelial defect, or loss of continuity of graft-host junction to suggest a traumatic etiology. Anterior segment optical coherence tomography showed DM break with a detachment in the right eye, which was treated with an intracameral C3F8 injection. DM break with detachment post-PK has been very sparsely reported in literature and is an important differential to remember when faced with an edematous graft, in addition to the diagnosis of graft rejection or failure. Descemet's membrane (DM) detachment leading to corneal edema in a postkeratoplasty eye is a rare entity especially when it occurs more than a decade after the surgery., The possible reasons for this to occur could be a recurrence of the primary ectatic pathology in the corneal graft or secondary to even a trivial trauma to the operated eye. In this case report, we discuss a case of spontaneous DM detachment 20-years after penetrating keratoplasty (PK). A 40-year-old man presented with a history of acute onset blurring of vision in the right eye of 1-week duration. It was associated with mild discomfort in the eye, but there was no history of pain or redness in the eye. He did not have any history of trauma to the eye preceding the blurring of vision. The patient had undergone a corneal transplant in the right eye 20-years back, followed by a lamellar corneal transplant in the left eye 5-years back. Following surgery, the vision had improved in both the eyes. The indication for surgery was not known, and no previous medical records were available with the patient. At presentation, the patient underwent a detailed ophthalmic clinical examination including visual acuity testing, slit lamp examination, anterior segment optical coherence tomography (ASOCT) (Optovue, Inc., Fremont, CA, USA), and corneal topography (Sirius, CSO, Florence, Italy). The best corrected visual acuity (with glasses) was hand movements close to face (HMCF) in the right eye and 20/80 in the left eye. Slit lamp examination showed diffuse corneal edema in the right eye which extended till just beyond the graft-host junction. The left eye showed a well opposed and a clear corneal lamellar graft [Figure 1]. The intraocular pressure measured by I care tonometer (Tiolat Oy, Helsinki, Finland) was 14 mmHg in both eyes. 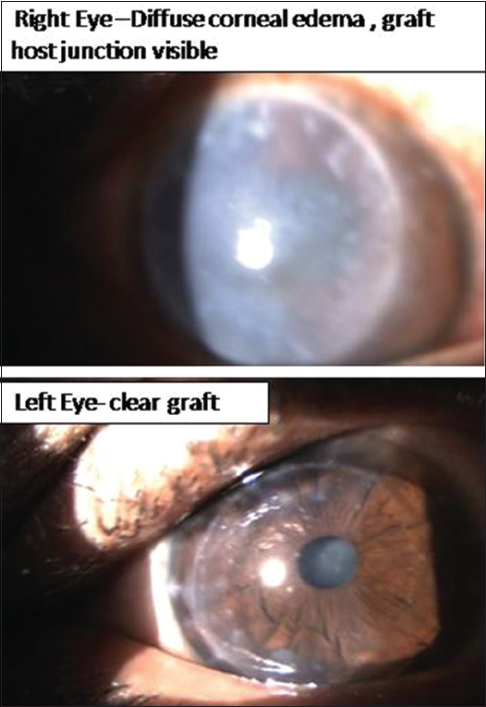 ASOCT showed an inferotemporal break in the DM just near graft-host junction with a large area of DM detachment involving the entire graft with an edematous graft in the right eye, and a well opposed lamellar graft in the left eye [Figure 2]. In the left eye, the residual stroma on ASOCT shows an area of possible central ectasia. This could suggest a preoperative diagnosis of keratoconus in this eye. The corneal pachymetry measured by ultrasound pachymetry was 620 μ in the right eye and 502 μ in the left eye. A diagnosis of DM break with a detachment was made. 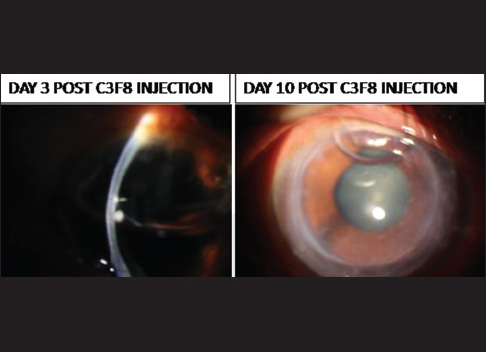 He underwent intracameral perfluoropropane (C3F8) injection for the right eye DM detachment under topical anesthesia and complete aseptic precautions. Postoperative medications included topical moxifloxacin 0.5% eye drops 4 times a day, topical fluorometholone 0.1% eye, drops 4 times a day and topical hypertonic saline 5% solution 3 times a day for 1 week. The patient was kept on close follow-up and was examined on day 1, 3, 7, and 10 postprocedure. The DM reattachment was observed on the 1st day postprocedure itself and confirmed by serial ASOCT images, and the corneal edema started clearing on the next day postinjection and cleared completely by 1 week [Figure 3] and [Figure 4]. The C3F8 bubble took around 2 weeks to clear completely, and the patient was asked to maintain a strict supine position to ensure complete attachment of the DM. There was no incidence of rise in intraocular pressure or severe pain post the injection of C3F8. His vision improved from HMCF to 20/80 with spectacles in the right eye at the end of 1 month. Delayed onset spontaneous DM detachment more than two decades after PK is a rare entitiy and sparsely documented in literature.,, The cause of the DM detachment may be a recurrence of the primary pathology in case of keratoconus, or it could also be due to a mechanical cause like trauma to the eye. In patients who have undergone previous corneal grafts, such a presentation with acute onset of corneal edema should be evaluated very carefully. A high index of suspicion should be kept to rule out corneal edema due to a break in the DM with consequent DM detachment in addition to graft rejection or failure. Important clinical signs which suggest this diagnosis are a DM break or detachment if visible through the corneal edema and sometimes stromal edema which crosses the donor-host corneal interface. 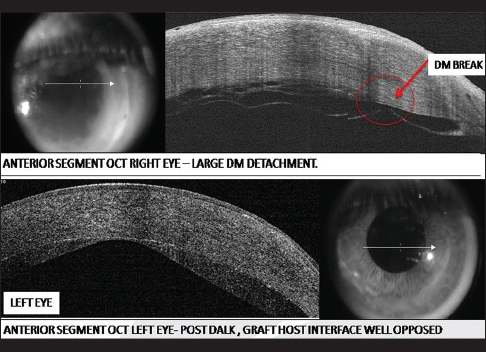 These findings can be confirmed on ASOCT scan which will clearly show the area of Descemet's break and detachment, as in our case [Figure 2] along with the extent of corneal edema. It is important to keep a high index of suspicion for such differential diagnoses to avoid missing an easily treatable condition. Gorski M, Udell IJ. Spontaneous Descemet's membrane detachment 20 years after penetrating keratoplasty for keratoconus. Invest Ophthalmol Vis Sci 2015;56:1560. Cason JB, Yiu SC. Acute hydrops in the donor cornea graft in non-keratoconus patients. Middle East Afr J Ophthalmol 2013;20:265-7. Oshida T, Fushimi N, Sakimoto T, Sawa M. Acute hydrops in a host cornea after penetrating keratoplasty for keratoconus. Jpn J Ophthalmol 2011;55:418-9. Ezra DG, Mehta JS, Allan BD. Late corneal hydrops after penetrating keratoplasty for keratoconus. Middle East Afr J Ophthalmol 2013;20:265-7.